Through Campfire, CABIN regularly facilitates broad educational opportunities to reach a wider audience by using more traditional training and educational approaches. 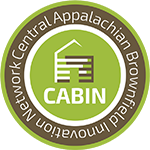 This includes an expert webinar series of common questions or topics of brownfield redevelopment as well as an annual Central Appalachian Regional Brownfield Summit. 1. Expert Webinars- These webinars help to supplement the in-person training opportunities provided by state and federal agencies, as well as other service providers, by addressing more specific topics and questions in a more timely fashion. Webinars also build the technological capacity of small organizations, allowing them to connect with CABIN and the rest of the region without the added cost of travel. Webinars also provide a way for communities to expand their networks and identify experts for potential peer-to-peer exchange opportunities. After interacting with speakers through the regular webinars, communities will be more familiar with the types of expertise that exist in the Central Appalachian Region and will be able to connect with those experts either directly or through the Redevelopment Expert Exchange. 2. The Central Appalachian Regional Brownfield Summit educates stakeholders from across the region on complex redevelopment issues; provides the opportunity for communities to network with peers, agency representatives, development professionals, and environmental experts in person; and highlights success stories from across the region.